If you possess a strong Belief theme, you have certain core values that are enduring. These values vary from one person to another, but ordinarily your Belief theme causes you to be family-oriented, altruistic, even spiritual, and to value responsibility and high ethics -- both in yourself and others. Don't be afraid to give voice to your values. This will help others know whom you are and how to relate to you. 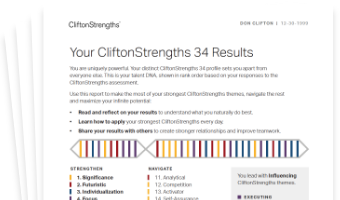 See how Belief shows in your CliftonStrengths results -- discover All 34 CliftonStrengths Themes today!